Thursday, April 26th. 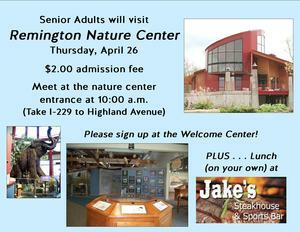 Everyone will meet at the nature center entrance at 10:00 a.m. to tour the facility, and then go to Jake’s Steakhouse for lunch. Admission to the nature center is $2.00 per person, and lunch is on your own. Sign up at the Welcome Center! *NOTE: The River Road is closed, so take I-229 to Highland Avenue to get to the Nature Center!